Gold is facing a back-to-back slump: the yellow metal's prices fell for the second time on Tuesday. "Gold prices have now erased 10 months of gains after posting their biggest monthly drop in more than three years, with Donald Trump's election to the US presidency only exacerbating a cocktail of negatives for the metal," Reuters reported Monday. MarketWatch.com echoed the media outlet highlighting that "the likelihood of a Federal Reserve interest-rate hike next week" and a stronger dollar in 2017 may cut demand for the precious metal. However, these prospects have not discouraged Russia and China from buying gold bullion at a steady pace. "He did it again. [Vladimir] Putin has bought gold. It wasn't he, personally, who bought it. Russia has bought gold. The issuing bank. And more than a little. 48 tons in one month. That is something. Moscow has obtained about 1.5 percent of its annual gold production," Nikolaus Jilch of Die Presse, an Austrian daily, wrote Monday. "This was the largest Russia's gold purchase in almost 20 years," the Austrian journalist underscored, "Within 24 months, the Kremlin's gold reserves have grown by nearly 50 percent." According to the World Gold Council, Russia has accumulated 1542 tons by November, 2016. 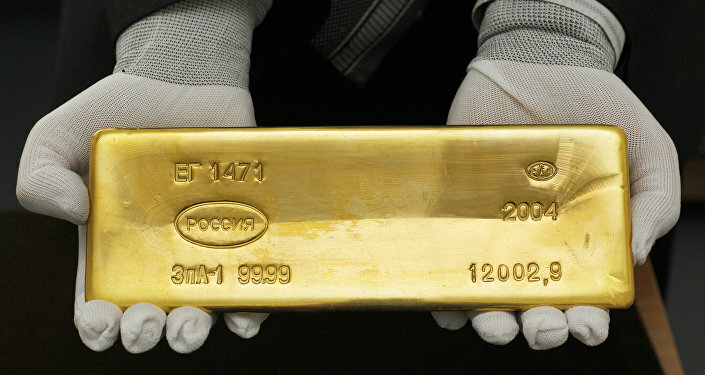 "Russia is just a little behind the second largest gold buyer on the planet. Meanwhile, China has collected 1840 tons," Jilch pointed out. So, what lies behind this gold-buying spree? According to the journalist, the answer is simple: gold is favored by many as a long-term investment. "And, of course, gold is a political metal," Jilch remarked. Those who want to learn more about the direction of the trend should take a look at issuing banks, he noted. The journalist called attention to the fact that in 2010 the world's central banks changed their strategy and began to accumulate gold. "This means that they began to take away more gold from the market than they sell it annually," he emphasized. The journalist recalled that more than a decade ago European central banks limited their gold sales following the introduction of the euro in September 1999. In 1999 major European central banks inked the Central Bank Gold Agreement (CBGA 1) which limited the amount of gold that they could collectively sell per year. "They stated that gold would remain an important element of global monetary reserves, and agreed to limit their collective sales to 2,000 tons over the following five years, or around 400 tons a year," the World Gold Council website explains, adding that the move was aimed at stabilizing the gold market. The Austrian journalist cited David Marsh, currency expert and co-founder of OMFIF (Official Monetary and Financial Institutions Forum), who noted that issuing banks are now buying 350 tons of gold per year. "It's about two things," Marsh said, "The developed countries are no longer selling [gold bullion] — and a number of developing countries are buying it. They do this because they do not fully trust the dollar for political reasons." Dmitry Tulin, Russia's Central Bank governor, explained Russia's appetite for gold by the fact that "only gold reserves are a 100 percent insurance against political and legal risk." For its part, China has made its gold policy more transparent and now regularly publishes data on its gold holdings, Jilch underscored, adding that the country's gold market is expanding. Furthermore, in April 2016 China's Shanghai Gold Exchange launched a new benchmark price for gold bullion, trading the precious metal in yuans. "The recently-opened Shanghai Gold Exchange differs greatly from the London Gold Exchange in one fundamental area: In Shanghai, buyers take physical delivery of gold whereas London deals in paper-based gold futures contracts. In Shanghai, 'what you buy is what you get' whereas in the West, gold is a virtualized commodity," Tom McGregor, Commentator and Editor at CNTV (China Network Television), told Sputnik this September. China's moves have prompted speculation that the country is going to introduce a gold-backed yuan. However, according to the Austrian journalist these assumptions are unfounded. Citing experts, Jilch assumed that the gold-buying spree on part of developing countries is caused by psychological factors rather than the intent to return to gold backed currencies. The journalist envisions that gold prices will continue to slide in 2017. However, it's good news for long-term investors.